Books are wonderful things that can teach children about the world they haven't seen yet, as well as make them feel a part of it when they see themselves represented. 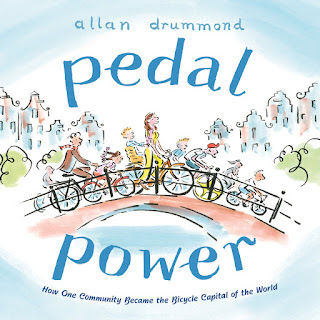 There are a tonne of books out there where people (or ducks, for that matter) drive around in cars & trucks, but it's a little harder to find books with cycling as a big part of it. We've tried to find a few for our children's collection, & by the looks of the thread on a recent post in the Vancouver Family Biking Facebook group, we're not alone in that. Here are a few bikey books to find at the library or buy for your kids (or better yet, suggest as gifts instead of yet another stuffie or forgettable plastic doohickey). 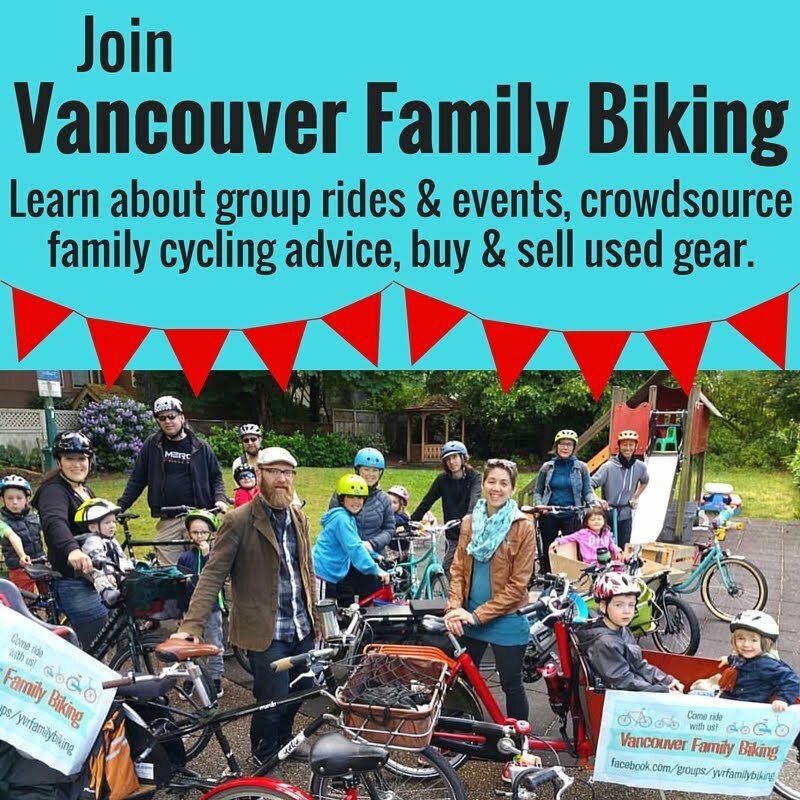 Hat tip to Lise for starting the thread in Vancouver Family Biking! 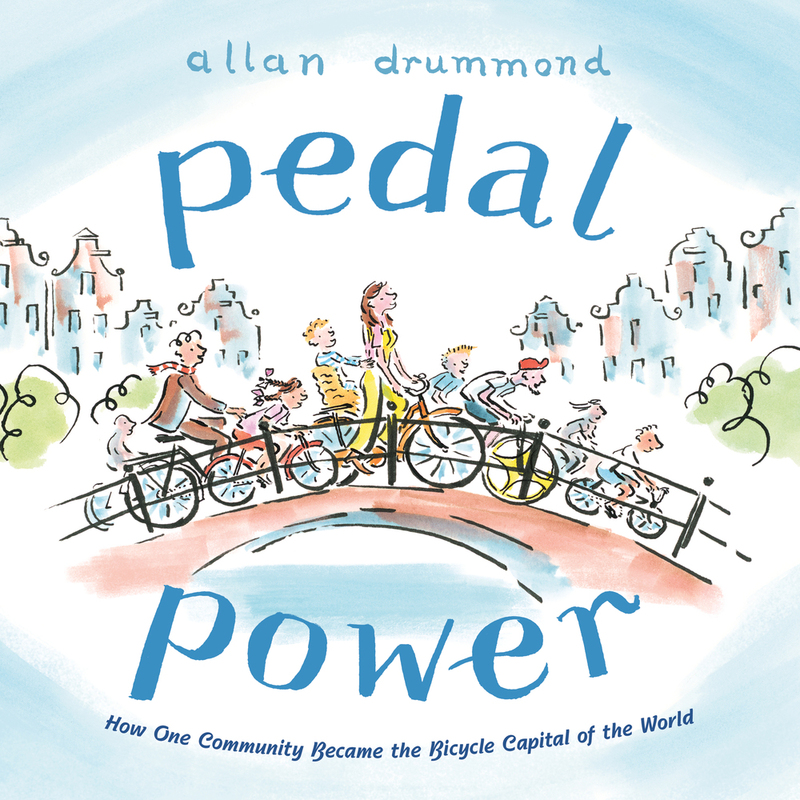 Pedal Power: How One Community Became the Bicycle Capital of the World, as you might guess from the title, is non-fiction, all about the history of cycling in Amsterdam. The colourfully illustrated picture book focuses on the story of young mom Maartje Rutten & how she helped to change her city for the better. There is also a short bibliography at the end of the book with some great online resources if you want to learn more. Duck on a Bike is a book after my own heart: it's sort of about a cycling advocate. Except he's a duck & the others he convinces to bike are also farm animals. A great read for preschoolers, in particular. Also, if you ride regularly, many of the other animals' reactions to Duck will sound familiar to you. The Girl and the Bicycle looks like one we'll need to get from the library. 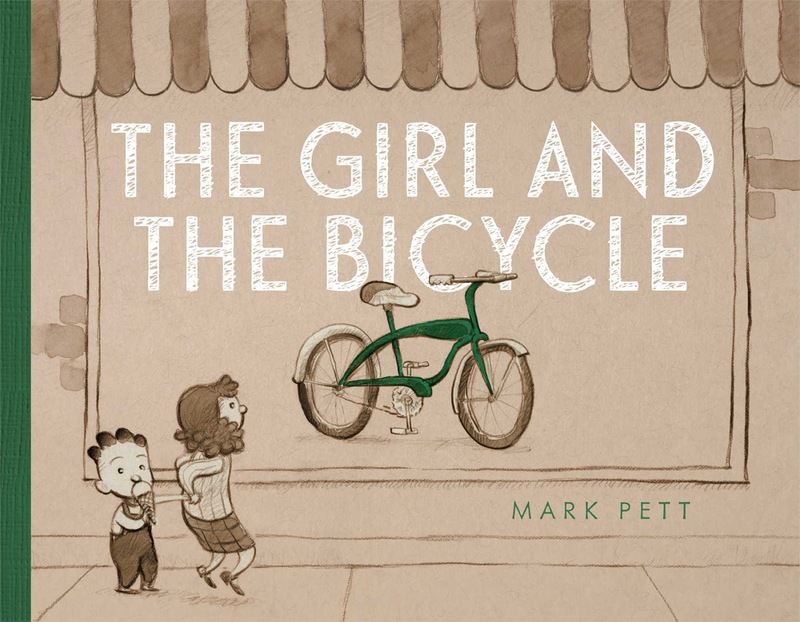 It's a wordless picture book where a girl sees a bicycle she wants to buy, then works hard for a nice neighbor to earn the money to buy it. At the end of the story she gets a lovely surprise. Along a Long Road is great for very young children, with one or two words on most pages. Frank Viva's bold & delightfully odd illustrations are so simple but they really capture the experience of riding a bike & the little details in your environment that you can see when travelling that way. 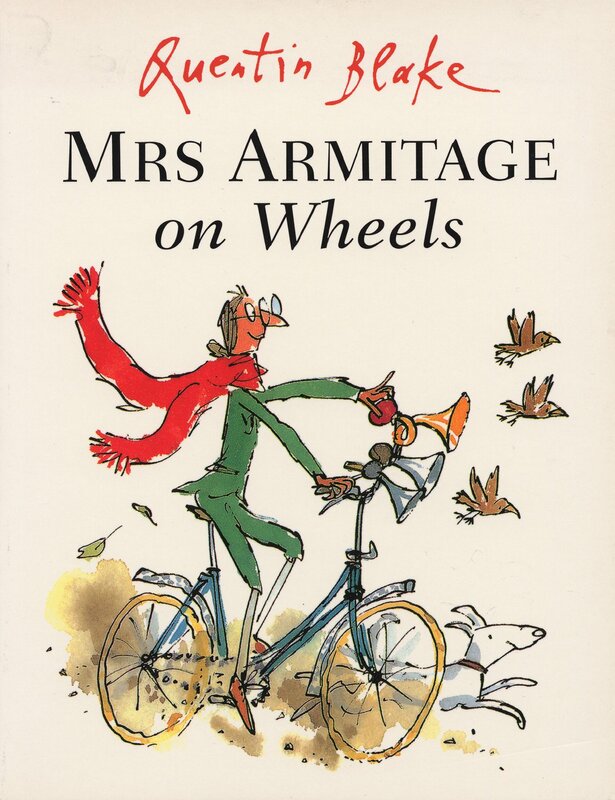 Mrs. Armitage on Wheels is one we haven't read yet, but we clearly need to, ASAP. First off, it's written & illustrated by Quentin Blake, one of my favourite artists. Secondly, how could you resist it after reading the teaser on Amazon? "Mrs Armitage sets off for a quiet cycle with her faithful dog, Breakspear, but she just can't help thinking of ways to improve her bicycle. Before very long she has added three very loud horns, a bucket of water to wash her hands, a complete tool kit. And by the time she has also added a seat for Breakspear, two umbrellas, a cassette player and a mouth-organ, Mrs Armitage is riding a very eye-catching contraption. 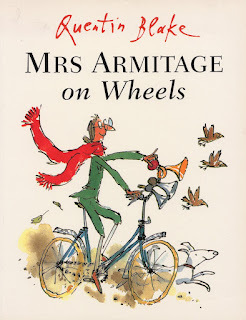 But it is when she finally adds the mast and sail, that Mrs Armitage really runs into trouble..."
Bear on a Bike has a very repetitive call & reply type structure that my kids loved because I would read the part on each page that was new, then they would complete it with the last bit. It comes in sturdy board book format that can handle the rowdiest toddler. Bonus: the edition that VPL has is bilingual, in Spanish & English! Hope you enjoy these bikey books with your littles. The Vancouver Public Library has all six of them, however, Mrs. Armitage is only available in Spanish & French. 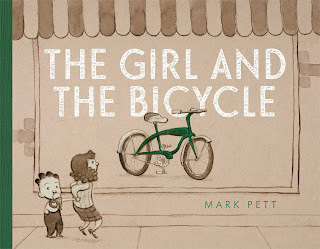 If you have a favourite kids book about biking, I'd love to hear about it--let me know in the comments! Also, this is only a sample of the books mentioned in the thread in Vancouver Family Biking--join the conversation here!